Prof. Baik's research team is posing for a group photo. Second row, left to right are Jae Won Lee, Kyeong Nam Kim, YoungMin Kwon, and HeeJun Kim. First row, left to right are Jeong Min Baik, Jinsung Chun, and Byeong Uk Ye. Large-scale Self-powered electronics may be the future. While triboelectric nanogenerator (TENG) has been proven as a promising device in energy harvesting and self-powered sensing, there still remains one important issue associated with large-scale production of practical self-powered devices. 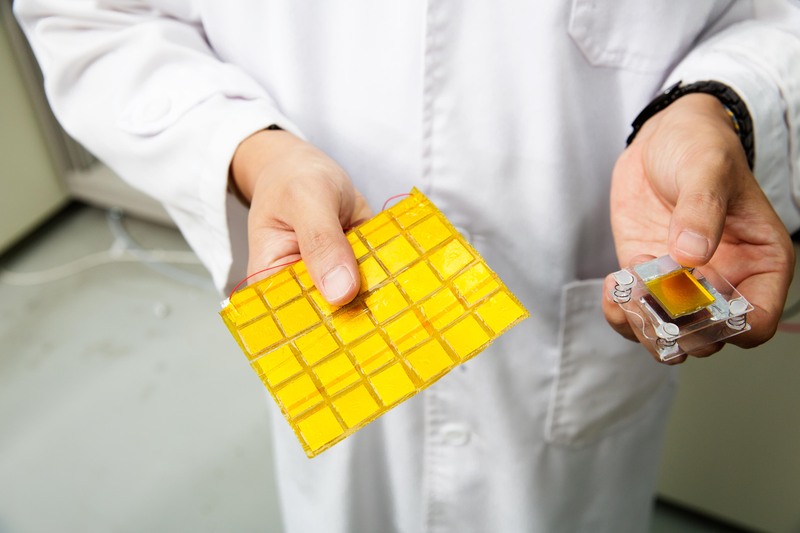 A group of research team, led by Prof. Jeong Min Baik (School of Materials Science and Engineering) at UNIST announced that they have developed a sponge-like nanogenerator that could be key to creating a new class of self-powered nanodevices. In this study, the team reported a facile and scalable synthesis of mesoporous films impregnated with Au nanoparticles, as effective dielectrics for enhancing the TENG’s performance. The team reported their development, which is the first of its kind, in a paper published August 6, 2015, in the journal Energy & Environmental Science. The new nanogenerator, shown to the left is made from sponge-like mesoporous films impregnated with Au NPs and it is compared with thin film-based nanogenerator, shown to the right. Prof. Jeong Min Baik (right) and his researcher Jinsung Chun, sharing their insights about their recent research project. 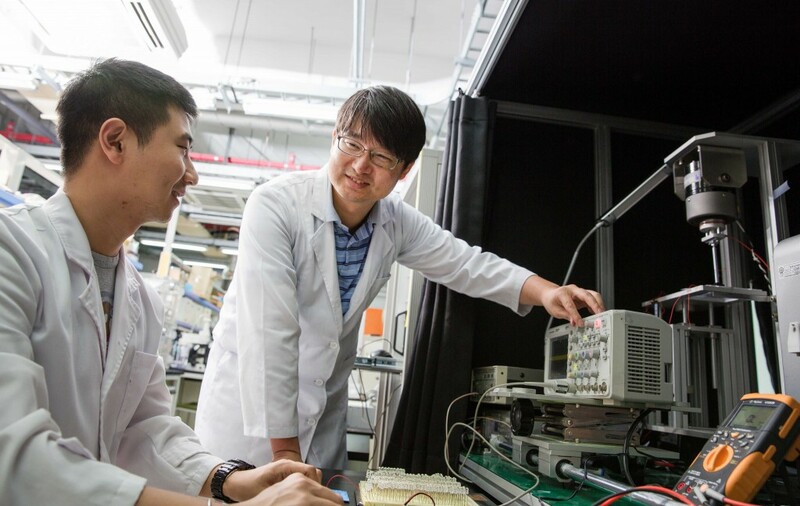 “We believe that our results will lead to the further advancement of nanogenerators as promising large-scale power supplies for realizing large-scale and practical self-powered personal electronics.” says Prof. Baik. This work has been supported by Samgsung Research Funding Center of Samsung Electronics. Jinsung Chun, Jin Woong Kim, Woo-suk Jung, Chong-Yun Kang, Sang-Woo Kim, Zhong Lin Wang, and Jeong Min Baik. (Aug., 2015), “Mesoporous pores impregnated with Au nanoparticles as effective dielectrics for enhancing triboelectric nanogenerator performance in harsh environments.” Energy Environ. Sci., 2015, Advanced Article.